The cost to remove a concrete slab depends on several factors. These include the area of the space, the thickness of the concrete, the working conditions, and whether the concrete is reinforced or non-reinforced. A small 100 ft2 slab removal usually costs $230 to $590 to remove. A mid-sized 500 ft2 slab usually costs $1,000 to $2,000 to remove. A large 2,000 ft2 slab can cost $3,800 to $9,300 to remove. Of course, repairing or leveling a slab is sometimes an option, but let’s examine some of the factors that impact the cost of removal in more detail to understand what affects price. This is the primary factor to consider when trying to find out the cost of removing a concrete slab. To calculate the amount of concrete you have, you must find out the length, width, and thickness of it. Once you know these preliminary figures, it is much easier to estimate the cost of your concrete project in your particular area as labor costs can differ across the country. It should be noted that removing a concrete slab isn’t recommended as a DIY project. The project requires a little skill and some specialized demolition tools. 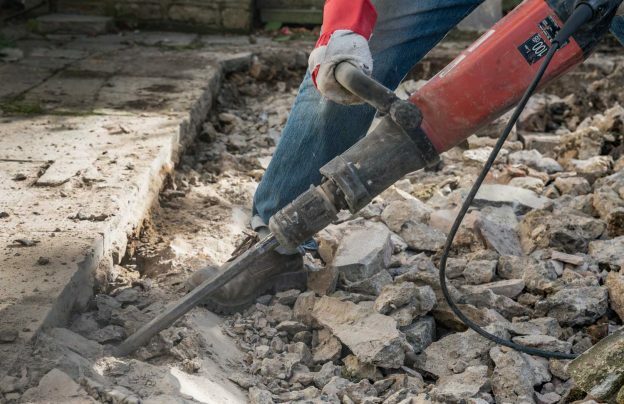 A pneumatic breaker is the standard tool used for demolishing concrete slabs, both non-reinforced and reinforced. At the low end, these cost at least $1,500, however, they can usually be rented for around $100 per day. The calculations that follow will assume that the project includes hired professional laborers. The type of concrete slab you need removed affects the cost to remove it. A reinforced concrete slab is more challenging to remove than a non-reinforced concrete slab. The difficulty is always proportional to cost where home improvement projects are concerned, so expect to pay more if your slab is made of reinforced concrete. The thicker the concrete, the longer it will take to demolish. Thus, the thicker it is, the more time it will take to remove, and the more it will cost. If you’re not sure about the thickness of the concrete slab you wish to remove, a 4 to 6-inch thickness is the norm, and the calculations which follow will be carried out for various thicknesses. Since you will almost certainly need to hire professional laborers to remove a concrete slab, it is appropriate to estimate labor costs for such a task. First, who do you need to hire? Is it a team of ten or will a single contractor be able to do it alone? Thankfully, one laborer will suffice for this demolition project. The average cost for demolition labor is $30 per hour. Time is of the essence when you’re paying someone per hour. It is wise to inform yourself about how long the project should take to better understand the costs involved. On the low end, non-reinforced concrete at 3-inch thickness will take 0.030 hours per square foot, while on the high end, reinforced concrete at 8-inch thickness will take 0.098 hours per square foot. In other words, the former can be demolished at the rate of 33 square feet per hour, while the latter is a lot more time-consuming at just over 10 square feet per hour. Now that we have more information about the relevant factors at our disposal, it is time to provide some specific cost calculations which will help you ascertain what your project will cost. Of course, every project is unique, so it’s essential to get an estimate from a professional contractor to better understand the costs of your project.